Honfleur in Normandy has been a vacation destination for over a century hosting artists, families and those looking for a seaside respite. While the town is inherently cute with its tall, plaster and beam medieval style houses, the community comes alive at the onset of Spring. Outdoor cafes spring up and street vendors pour onto the wide docks. 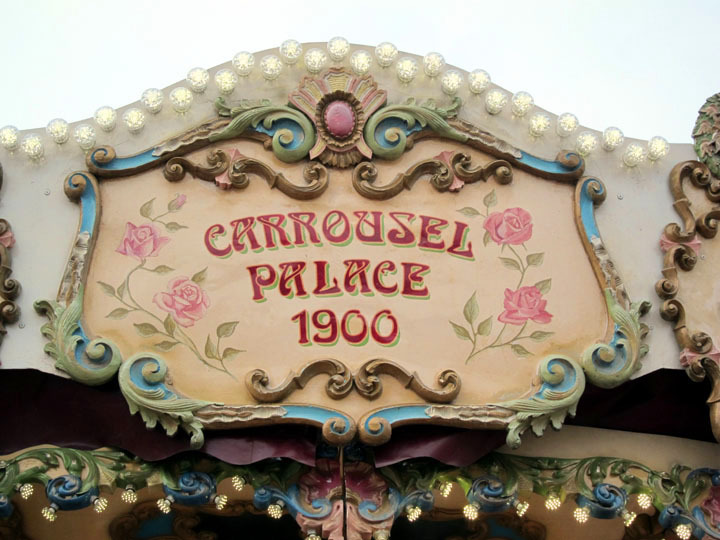 But there is one feature that really signals the arrival of Spring – the antique carousel! When I visited in March it had just re-opened and was taking the first visitors of the year on a colorful (albeit chilly) ride. 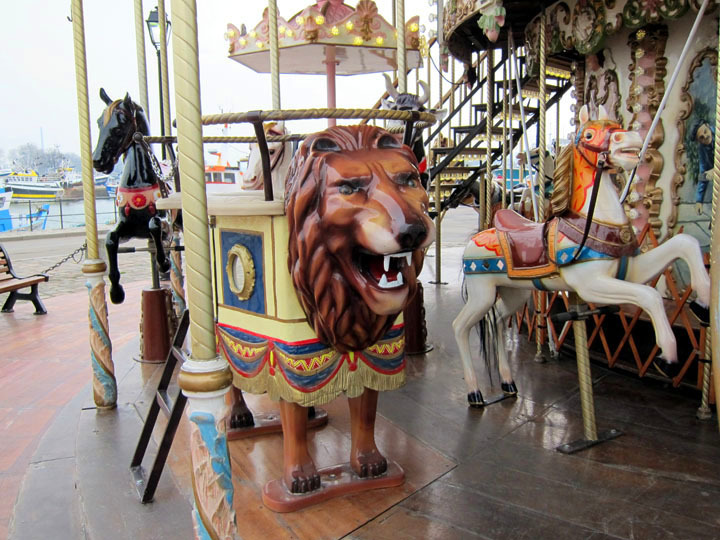 A sign that Winter is over – Honfleur’s vintage carousel! I could find surprisingly little information about the carousel. It was in such excellent condition that I am not inclined to believe the “1900” date imprinted on the central upper panel. There are in fact four very similar carousels in Angers, Bordeaux and Fontainebleau, France and San Sebastián, Spain which each have this 1900 label. 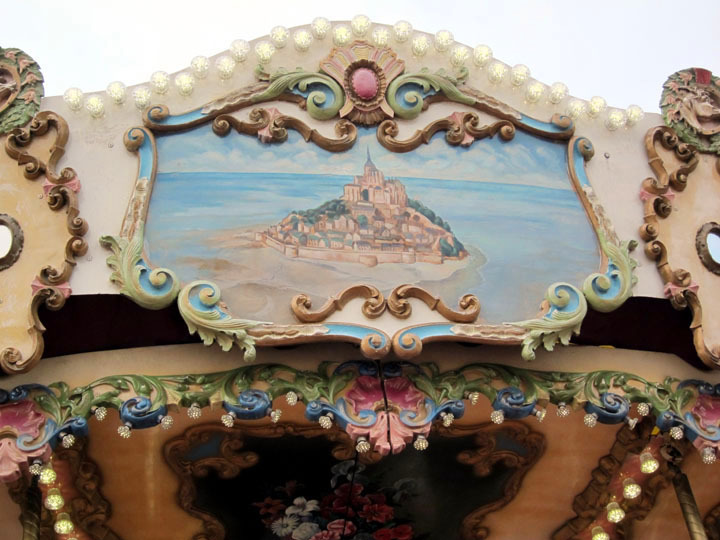 Still this doesn’t diminish from the beautiful carvings, painting and design of this carousel. 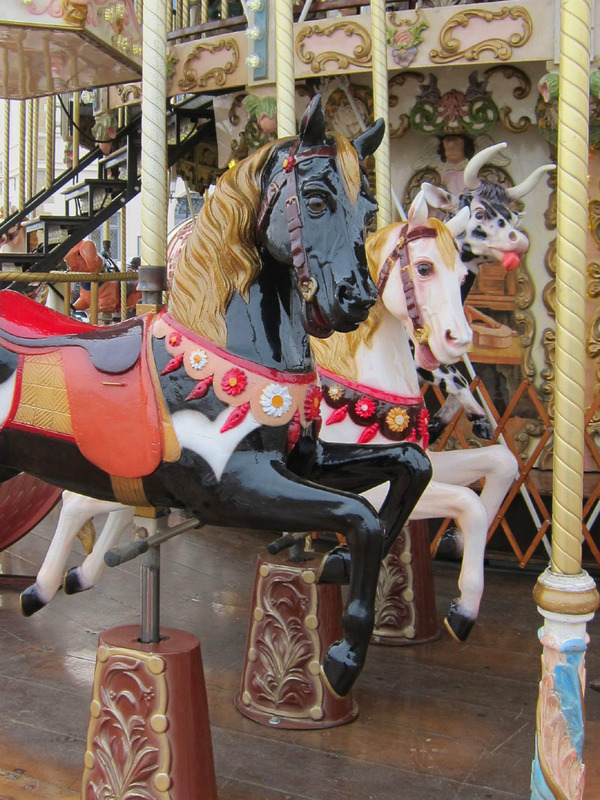 The Honfleur Carousel is looking good for 113 years old! The animals were brightly painted with a glossy finish. The carousel interior was covered with curling Victorian style plant motifs that popped with areas of rose, sky blue and mint green. The color was off-set with gold painted filigree. I will say the animals were very cold when I rode the carousel! This is more of a March and November problem, something definitely not encountered in July. The top of the carousel is decorated with paintings of French landmarks. Recognize this one? 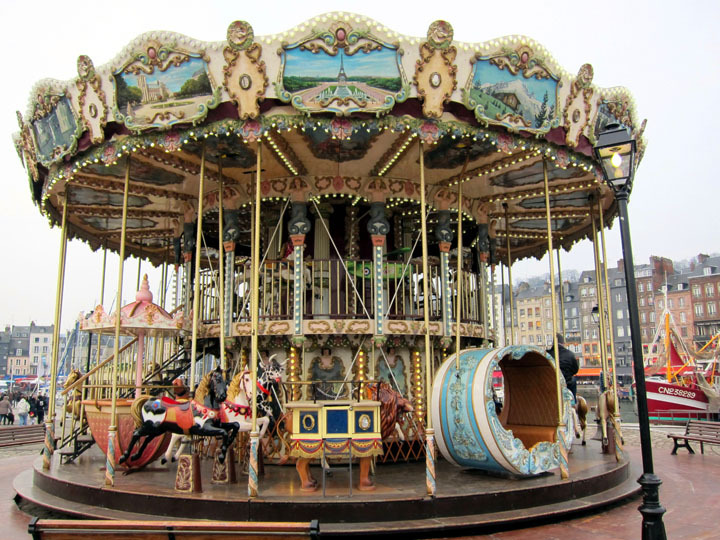 The carousel was a very beautiful piece of art that brightens up the Honfleur harbor. It’s nice to enjoy a very traditional amusement ride. I bet many, many people have enjoyed this ride and I imagine there will be many more before this carousel retires. Now that it is mid-November, it will sit for the winter and then re-emerge for the first lucky travelers of 2014. What a spirited carousel…was there music as it twirled? Oh my goodness, how adorable is that! And in very good shape for 113 years old. The Honfleur carousel is similar to the one I rode at the Herschell Carrousel Museum outside Buffalo, NY, in that it has local scenes painted on the top. I’d love to add the Honfleur carousel to my collection (of memories)! Beautiful! We used to visit Honfleur when I was a child, I have to go back someday! I bet that was a fun vacation when you were I child! Hope you get back soon!